Place 1 1/2 cups of sugar, cornstarch, tapioca and salt in a large mixing bowl. Mix well. Add in berries and toss to coat. Let stand for 15 minutes. Lay one pie crust in the bottom of your temp-tations® deep dish pie plate. Press down dough so it forms to the shape of the pie plate. Wet the top edge with a little bit of water. Pour berry mixture over the bottom crust. Spread evenly. On a lightly floured surface lay your second crust. Using a cookie cutter, cut the "pi" symbol into the middle of the crust. Carefully lay crust over the top of your pie plate. Press down edges to seal. Trim off any extra dough and crimp edges with your fingers or a fork. 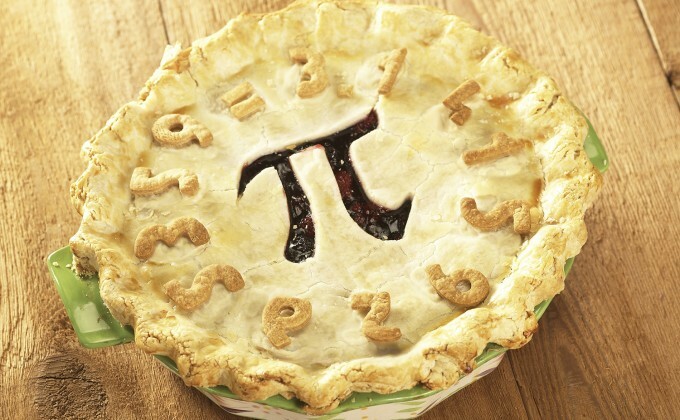 With any extra crust cut numbers out with cookie cutters to match the "pi" symbol (3.14159) and lay on top of crust, using a little water to make them stick. Brush the top of the pie with milk and sprinkle with 2 teaspoons of sugar. Place pie on a large cookie sheet and bake for 15 minutes. Reduce temperature to 375 and loosely cover edges with strips of foil. Bake for another 45 minutes or until golden brown. Let stand for 2 hours before serving.